We want to make it even easier for you to build complex, distributed applications by connecting multiple web and microservices. Whether you are implementing a complex business process or setting up a processing pipeline for photo uploads, we want you to focus on the code instead of on the coordination. We want you to be able to build reliable applications that are robust, scalable, and cost-effective, while you use the tools and libraries that you are already familiar with. 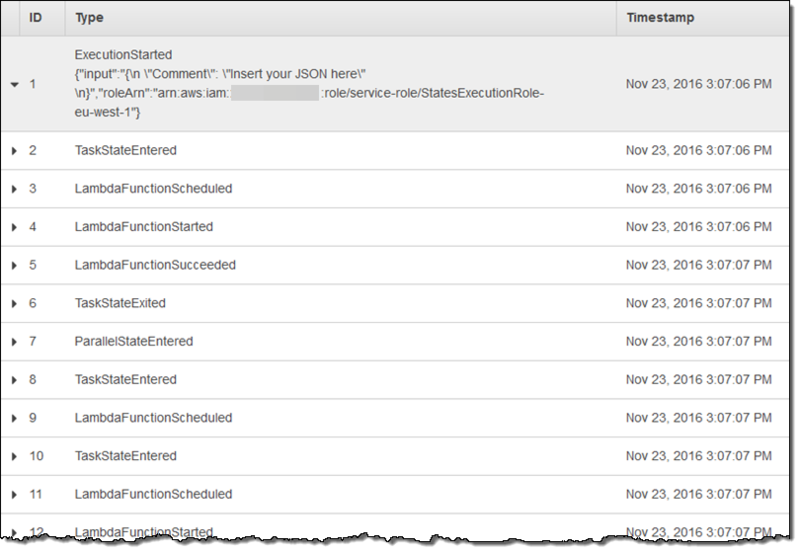 Today we are launching AWS Step Functions to allow you to do exactly what I described above. You can coordinate the components of your application as series of steps in a visual workflow. 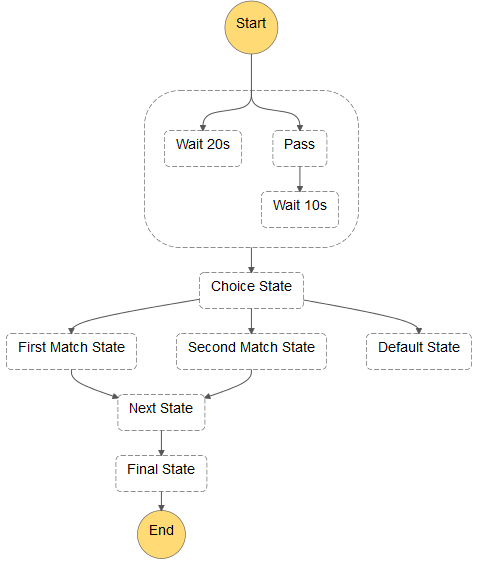 You create state machines in the Step Functions Console to specify and execute the steps of your application at scale. Each state machine defines a set of states and the transitions between them. States can be activated sequentially or in parallel; Step Functions will make sure that all parallel states run to completion before moving forward. States perform work, make decisions, and control progress through the state machine. Multiple copies of each state machine can be running independently at the same time; each copy is called an execution. 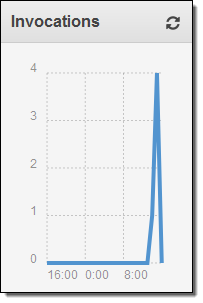 Step Functions will let you run thousands of execution concurrently so you can scale to any desired level. There are two different ways to specify what you want to happen when a state is run. First, you can supply a Lambda function that will be synchronously invoked when the state runs. Second, you can supply the name of an Activity. This is a reference to a long-running worker function that polls (via the API) for work to be done. Either way, the code is supplied with a JSON statement as input, and is expected to return another JSON statement as output. 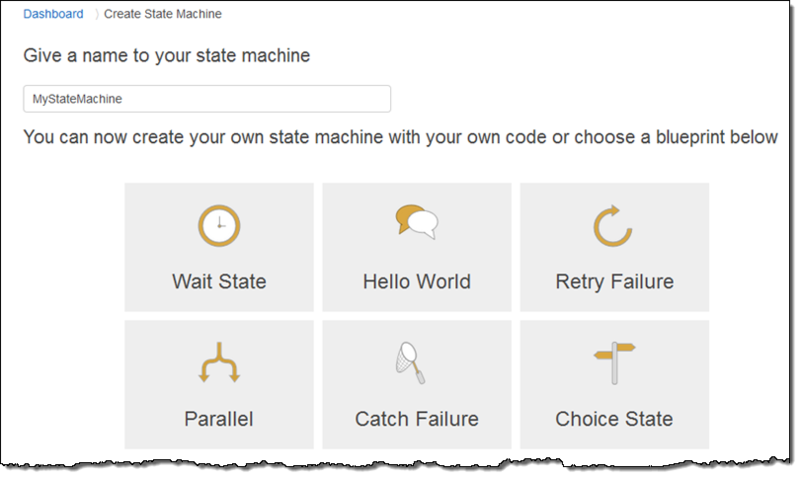 As part of your state machine, you can specify error handling behavior and retry logic. This allows you to build robust multi-step apps that will run smoothly even if transient issues in one part of your code cause a momentary failure. 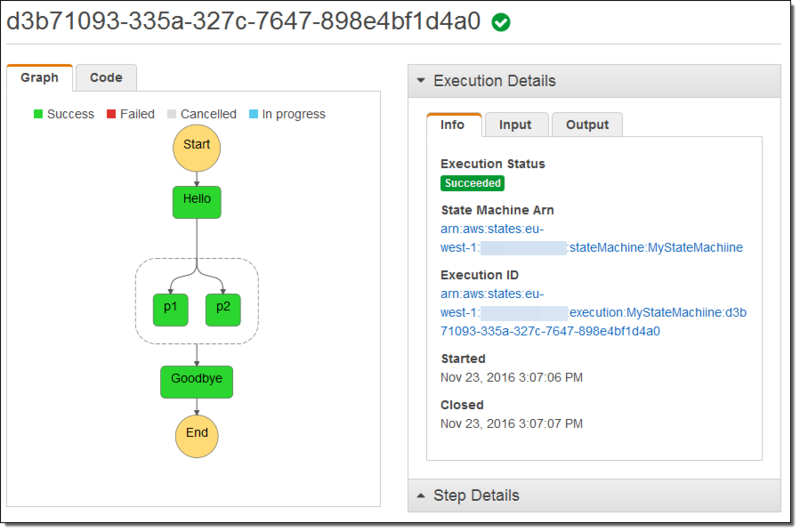 Let’s set up a state machine through the AWS Management Console. Keep in mind that production applications will most likely use the AWS Step Functions API (described below) to create and run state machines. 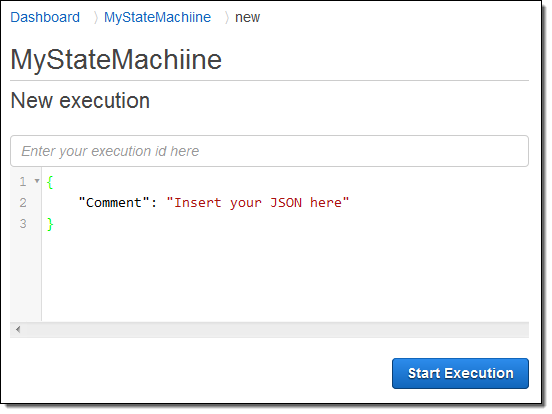 CreateStateMachine – Create a new state machine, given a JSON description. ListStateMachines – Get a list of state machines. StartExecution – Run (asynchronously) a state machine. DescribeExecution – Get information about an execution. GetActivityTask – Poll for new tasks to run (used by long-running workers). You could arrange to run a Lambda function every time a new object is uploaded to an S3 bucket. This function can then kick off a state machine execution by calling StartExecution. The state machine could (as an example) validate the image, generate multiple sizes and formats in parallel, check for particular types of content, and update a database entry. The same functionality is also available from the AWS Command Line Interface (CLI). You can use our new statelint gem to check your hand or machine-generated JSON for common errors including unreachable states and the omission of a terminal state. 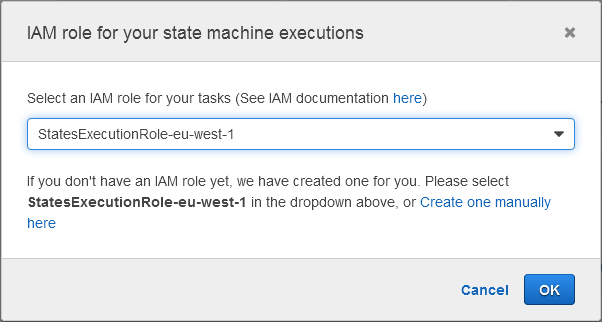 State Machine.States.Goodbye does not have required field "Next"
AWS Step Functions is available now and you can start using it today in the US East (Northern Virginia), US East (Ohio), US West (Oregon), EU (Ireland), and Asia Pacific (Tokyo) Regions. As part of the AWS Free Tier, you can perform up to 4,000 state transitions per month at no charge. After that, you pay $0.025 for ever 1,000 state transitions. You can learn more during our webinar on December 16th. Register here.